Nice timing that. 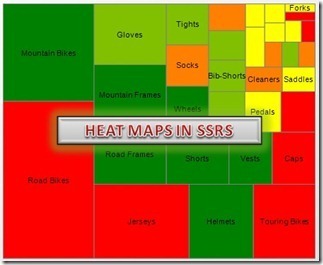 I have just been asked by my manager if I could make a heatmap in SSRS for our IT architecture repository. System.FormatException: 24141: A number is expected at position 26 of the input. The input has ,. Can you let me know at which step you get this error? Also can you paste the code that generated this error? I'm at step 4. I tried to write the SQL Statement in MgmT Studio. If I limit it to 1 row, it works, as soon as there are more than 1 rows as result, the error is thrown. Can you make sure that there are no null or blank rows returned in the result? If you still have the issue, can you mail me at jason143@gmail.com so that I can have a look at your code? Can you post your "select statement" as well as some sample results of the select statement to jason143@gmail.com? Thanks Jason. The solution worked.The error got resolved. Glad to hear that you were able to resolve it. And no, I dont have any post on localisation at the moment. Hi Jason, I registered the DLL, but it is behaving strangely. Any idea why it is behaving like this? Permissions on tables ?